The Bommarito was one of the prototype self-loading rifles presented to the US Ordnance Department during the early 1900s. It was chambered for the standard .30-06 cartridge, fed from 20-round detachable box magazines, and was invented by a man named Giuseppe Bommarito. On April 5th, 1918 the War Department allocated $2500 for its development, followed by an additional $2000 on September 28th, 1918. The investment didn’t produce a useful result, as the results of extensive testing were “unfavorable”. Its principle operating problem, apparently, was a habit of failures to extract, with a subsequent problem of the action very difficult to open manually with a stuck case in the chamber. The design was tinkered with by Major Elder (who also worked with the Rychiger rifle), but without any ultimate success. The design used a short-recoil toggle lock similar to the Luger, with a recoil distance of 1.25 inches. This is a bit unusual – much longer than most short recoil designs, but not long enough to be a long-recoil system (which requires the locked recoil distance to be equal to or greater than the length of the cartridge). Because of this long recoil distance of the barrel and the size of the toggle lock arms, it was found to be a very awkward weapon to use, and liable to injure shooters’ fingers during handling. 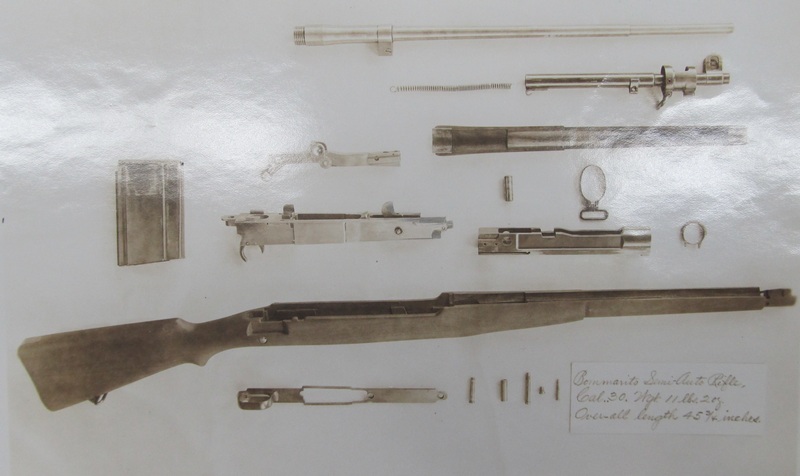 Bommarito rifle fully disassembled (courtesy of the US National Archives via Miles Vining). Click to enlarge. 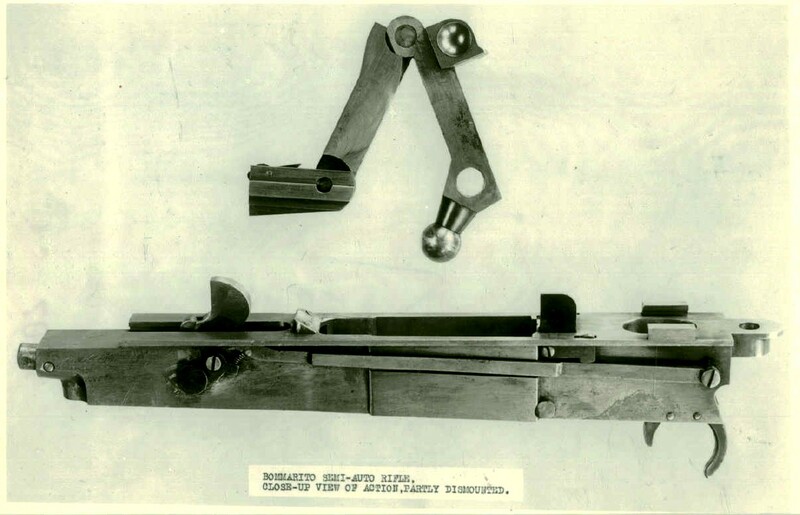 Bommarito rifle major components (courtesy of the US National Archives via Miles Vining). Click to enlarge. Bommarito rifle toggle (photo from Springfield Armory National Historic Site archives). Click to enlarge. These photos make it clear how the rifle actually worked. Note how the front sight is mounted on what is actually just a barrel sleeve locked into the stock. The barrel itself travels inside that sleeve, which probably would have had adverse consequences for accuracy had the rifle progressed far enough for accuracy to be a consideration. The small diameter coil spring connects the moving barrel to the front barrel sleeve (note the small hook at the rear of the sleeve), providing the force to pull the barrel forward after each shot. This sleeve also allows the rifle to retain the look of a fixed-barrel weapon, since the moving barrel and extension are hidden under the handguard. In theory, that should also aid reliability by shielding the mechanism from ingress of dirt. The toggle lock uses the ball at one end as a pivot point. It is set in a socket in the receiver, while its lugs lock into the square cuts in the barrel extension. The ball remains in its socket as the barrel and barrel extension move backward, which forces the toggle joint to break, and after enough travel the locking lugs disengage and the barrel is pulled forward by its return spring while toggle continues to open, to eject the empty cartridge case. I wonder if Giuseppe Bommarito worked for Winchester. 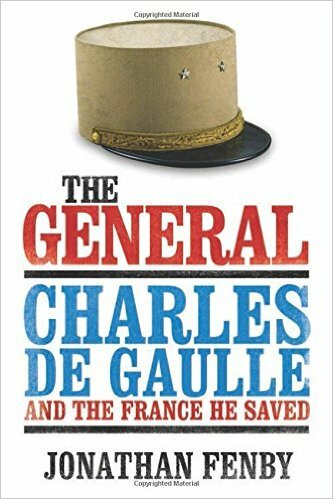 It would explain how he would be able to get a hold of M1917 rifle parts and BAR magazines in early 1918. One sees that in many of these early self-loading rifles, failure to extract was common. My questions are: why did most machines not have this problem and what ways were used besides fluted chambers to solve this? The most common fault was a breech lock system which did not have a slow primary extraction phase to “break” the cartridge loose from the chamber walls before main extraction. 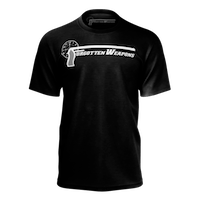 All turnbolt rifles have this slow initial phase, that being the rotation of the bolt to unlock; the cartridge, held by the extractor, rotates with the bolt just enough to break it loose. This is the most common way of dealing with the problem even today, as shown by the preponderance of self-loading rifle actions with rotating bolts. Some non-rotating bolt actions, such as lever-actions and straight blowbacks, rely on relatively low chamber pressures to prevent to great adhesion to begin with. This is the reason early straight blowback rifles like the Winchester Self-Loading Models of 1907 and 1910 used their own “proprietary” rounds, which were in the same general power and pressure range as the pistol-type rounds common in the company’s lever-action carbines. I might add that even high-powered black powder rifle rounds, such as the Winchester 45-90, were very low pressure rounds compared to even medium-bore smokeless powder rounds like the .30-06. Which did in fact have extraction problems in the Model 1895 lever-action. The fluted chamber allows a slight washback of firing propellant gases to “float” the cartridge in the chamber, not so much to break it loose as to reduce adhesion to begin with. This method does not require a rotating bolt or bolthead, and is the one preferred by Heckler & Koch on their recoil-operated weapons. Probably the most common method in early to mid 20th Century arms with neither fluted chambers or rotating bolts was pre-lubricated ammunition, as used on automatic cannon like the various renditions of the Becker/Oerlikon/Hispano/AN family. IIRC, the Pedersen rifle, which as Ian states had a Parabellum-like toggle action similar to the Bommarito, needed cartridge cases coated with a special hard wax, one of the reasons the Army (or more specifically MacArthur) didn’t like it. Most Japanese and Italian machine guns used during WW2 required pre-lubricated rounds. Some even had oilers built into the gun itself, which at least meant that the oil (with its penchant for attracting dust, grit, etc., which worked on the gun’s chamber rather like valve-lapping compound in a car’s motor) was only applied just before chambering. The later guns like the Japanese Type 99 LMG had the oiler built into the magazine loading machine. Which was seen as an improvement. In terms of making the gun itself simpler mechanically, yes. In terms of actual use, no. The rounds now had days or weeks in transit, etc., to gather detritus before being fired, with the predictable consequences for the chamber walls. Slow primary extraction is a very necessary feature of self-loading actions, even more so than most manual repeaters. But it took a while for designers to figure that out. The FN FAL doesn’t use a rotating bolt. The FN MAG machine gun doesn’t use a rotating bolt. Lots of automatic weapons don’t use rotating bolts. The reason why rotating bolts are popular is that it allows the high strength portion of the receiver to be relatively small, making the weapon cheaper and lighter. Many other locking mechanisms lock further back, require stronger, more expensive, and heavier, machined receivers. As to whether a rotating bolt provides primary extraction in automatic weapons, I’ve heard that theory advanced many times but I’ve never seen any proof of it. I watched a youtube video on the M14, an original Army instruction one “music etc” and that mentioned what eon says about the rotary bolts purpose in regards extraction as oppose merely providing a locking mechanism. But like you say MG, SLR’s etc don’t use rotary bolts and neither do they have fluted chambers… So I assume it is something to do with the speed of this primary extraction lark i.e. If the bullet has left the barrel for longer pressure will be lower, and it’s pressure which expands the case inside the chamber – So with less pressure perhaps the extraction is easier, therefore the SLR is presumably more delayed than the M14? Actually, the Type 99 LMG didn’t have oiled ammunition because Nambu finally fixed extraction issues in 1939. You must be talking about the Type 96 for oiled rounds. In any case, this rifle would likely have lost a shooting match with the terribly designed G.41 (M) or with the ultra-rare Roth Krnka long-recoil-operated hunting carbine. If that barrel spring failed frequently, no wonder the rife suffered jamming. Would the ridiculous Paul Mauser short-recoil rifle design be considered a better choice had the charging handle/bolt assembly been redesigned? Maxim based machine guns used a muzzle booster to provide most of the impetus to operate the action, rather than recoil per se. Thus their extraction event occurs much later in the cartridge pressure curve, when pressures are much lower,than a recoil only action. This is one of those firearms designs which might have worked if the designer had access to high speed cinematography. Germans were the first to employ high speed cinematography in their 1930’s MG designs,and it shows in their successful performance. It’s a shame it didn’t work out. It’s a very pretty rifle. There is a significant difference between the Pedersen and the design shown – the Pedersen’s barrel was fixed. This was the reason for cartridge lubrication. This design would have a gradual extraction as the barrel, receiver, and bolt all begin recoil at the same velocity. The rate of extraction would be dependent on the interaction between the ball joint and the corresponding pocket located at the rear of the lower receiver. It appears that the ball joint is not the pivot point for the rear link, but the cam that controls the timing of locking/unlocking. This internal cam would be advantageous with respect to dirt. The large crosspin at the rear of the upper receiver appears to be the rear link pivot and provides the reaction point for all recoil forces. The combination of a relatively short arm for the ball joint, a high loading on the crosspin, cam angle, and friction at the cam could be a possible explanation for extraction problems after firing. During manual operation when the crosspin was lightly loaded, the geometry alone could also cause difficulty opening the action whether a cartridge case was stuck or not. A look at the geometry of the pocket would be valuable in diagnosing the problem. If geometry were the problem, a change to the angle of the ball joint arm, cam surface, or switch to a ball bearing would likely resolve the issue and would result in a design that, as Ian noted, is fairly easy to manufacture. Without looking at the rest of the geometry and timing, I’d wager that the penalty for changing the cam geometry is a longer travel of the barrel. In engineering, you never get something for nothing. In other words it wouldn’t happen if it had been long recoil, perhaps it couldn’t have been short recoil like a luger simply due to the cartridges length i.e. Timing for the toggle to break, without the pressure being at an unsafe level. But long recoil wouldn’t have worked at all, or it would have been impractical that’s why they did this halfway version which did work but not well seemingly. Once again, a good theoretical concept, but even if the extraction issues could have been worked out, having that toggle flying towards the shooter’s face and blocking the line of sight would have likely had a detrimental effect on the shooter/accuracy. I bet a lot of trainees would have developed a flinch if this would have been their general-issue weapon. Nice looking rifle, though. I’ve always liked the lines of the 1914/17 Enfields. Very interesting. Looks ahead of it’s time. But, Did the US Army really want a Semi-Auto rifle that? Perhaps anecdotal but I’ve read reports from top Army Brass that complained about the M-1 Garand wasting Ammo. Glad I found this great site. I suspect that by choosing quite a long short-recoil length there’s no residual chamber pressure to help with extraction, and there’s just not enough momentum in the toggle parts to rip the case free. With the FAL, primary extraction is under gas impulse from the operating rod. Also with the AR15 – it’s still under gas actuation (there’s no camming primary extraction in the AR system) So no problems.